The European safety watchdog issued a notice about the conflict in Syria. EUROPEAN AIRLINES HAVE taken safety measures after the region’s air safety body issued a warning about Russian missiles being fired at Syria. The European Aviation Safety Agency (EASA) took action to avoid a repeat of the tragedy involving Malaysia Airlines flight MH17, which was shot down over war-torn eastern Ukraine last year, killing all 298 people on board. Dutch investigators concluded in their final report yesterday that the Boeing 777 was brought down by a Russian-made BUK missile. 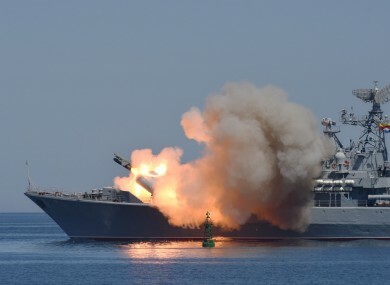 Russia is intensifying its air campaign against insurgents in Syria and last week also launched a salvo of cruise missiles from its warships in the Caspian. Hong Kong-based airline Cathay Pacific said it had halted all flights over the area in response to the dangers from last Thursday “until further notice”. Cathay already has a long-term policy not to overfly Iraq, Afghanistan, Ukraine and Syria, its statement said. Air France said it had introduced measures after receiving the EASA warning on 9 October. “From 10 October, on the recommendations of its safety directors, Air France has temporarily put in place special measures concerning the flyover of Iran and the Caspian Sea,” France’s national flag carrier said, adding that security considerations prevented it from giving further details. Air France is not currently flying over Yemen, eastern Ukraine, Syria, Iraq and Libya. In its safety information bulletin, EASA said “missiles en-route to Syria crossed airspace in Iran and Iraq below flight routes used by commercial transport aeroplanes”. The missiles had been launched from the Caspian Sea, it said, adding that the advisory was to “create awareness” for airspace users. Australian carrier Qantas said it had chosen not to suspend flights over the area. “The Europeans said that those issues were there, but didn’t make any recommendations or changes to what airlines do,” its Irish chief executive, Alan Joyce, said. Qantas flies over Iran on its Dubai to London leg. Singapore Airlines said it had “resumed normal routings” after previously diverting some flights to avoid the Caspian Sea area. The airline said decisions on flight routes were “based on numerous factors” and added that it only used routes that had been cleared for use by the authorities. Low-cost European operator Norwegian suspended its flights over Iran on Friday as part of its routes between Scandinavia and Dubai following advice from the EASA, but resumed services yesterday. Austrian Airlines said its planes were continuing to fly over the Caspian Sea. Our planes fly at 10,000 metres while Russian missiles only reach a very low altitude and therefore present no danger for the moment,” spokesman Wilhelm Baldia said. Russia’s defence ministry said its jets hit 40 Islamic State targets in new strikes in Syria over a 24-hour period, destroying several ammunition depots and training camps. Washington and its allies – engaged in their own air war against the Islamic State group in Syria and Iraq – accuse Moscow of targeting moderate Western-backed rebels and seeking to prop up President Bashar al-Assad, a long-time Russian ally. Email “One airline scraps flights over Middle East after Russian missile strike warning”. Feedback on “One airline scraps flights over Middle East after Russian missile strike warning”.